Our first tangle with “Carnevale of Horrors” for the Arkham Horror card game. The yellow trash can in the lower left was our way of remembering which of the masked revelers were secretly monsters. Little did we realize the encounter deck had a card to prevent such tactics. Wendy finds herself confronted by two Deep Ones, by way of Monsterpocalypse figures. 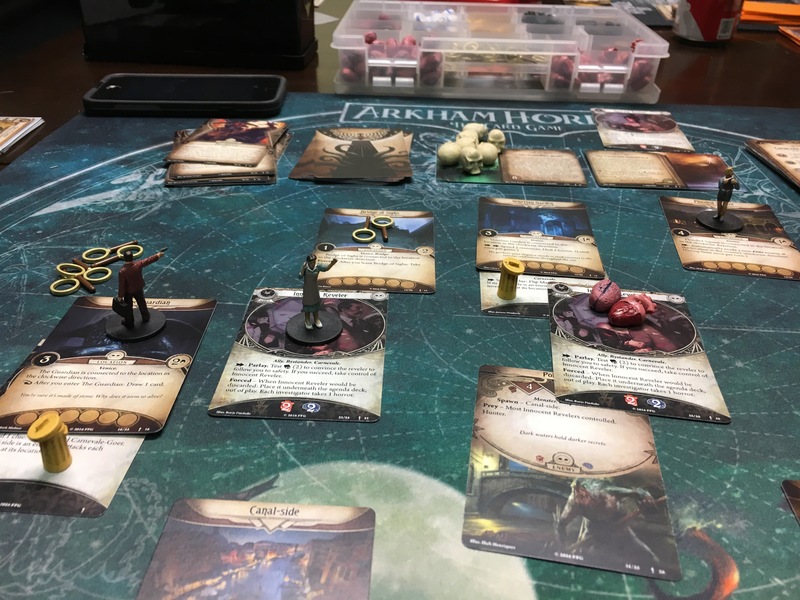 For the third and final scenario of the Night of the Zealot introductory campaign for Arkham Horror: The Card Game, we found ourselves short one plucky librarian, owing to the whims of the weather. So Ray, Tom and I decided we’d call this a practice run and see what happened before playing “for real” when Carlo could join us. In short and without getting spoilery, we got housed. We had one decent shot at achieving anything resembling a victory, but the path to that pyrrhic, ethically ambiguous victory was clogged with extraneous monsters and there was no way to clear it. The general consensus seems to be the introductory scenarios are highly variable. Some people report walking through them without breaking a sweat. Others, like I and my friends, get walloped every time and seemingly without any ability to fight back. I imagine we’re just not playing very efficiently and that people who are more used to this style of cooperative card game — Arkham reportedly shares as much DNA with Lord of the Rings: The Card Game as it does with Netrunner, if not more — are more used to the deck design and play style that gets stuff done in spite of the endless series of obstacles the game throws up. Umordhorth, the Devourer Below, as rendered in a Monsterpocalypse figure, is unimpressed by investigators who futilely scrabble to throw tasty morsels in its maw. Also, Tom wanted me to talk more about what he did during the game, so I guess I’ll mention that Skids got trapped in the woods and spent the remainder of the game, which was four or more turns, completely unable to get out of that location or contribute to the nonsense happening just one space over. 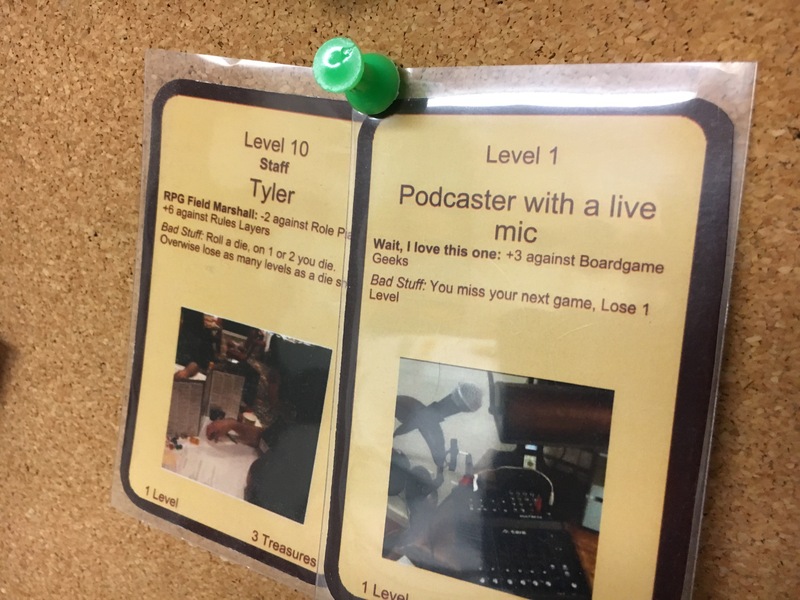 Furthermore, during setup for the game Tom couldn’t find his tokens — they were hidden under a Terry Pratchett novel — so after tearing his basement apart, we mocked up a chaos deck with a stack of playing cards. Sifting through more stuff in the wake of purging empty boxes, I came across a trove of materials from convention games I’ve run over the years: several Ghostbusters scenarios from Carnages past, Unknown Armies‘ archetypal Jailbreak, and this particular gem, The Celestial Legion. It’s a Hellboy/B.P.R.D. adventure I wrote back when I was getting around to more conventions in New England than Carnage. Forgive me, purists, because it was written using mainly Guillermo del Toro’s Hellboy film as inspiration, because that was my first real experience with the character. Only in the case of my conception of the B.P.R.D, most of the team members are weirdos like Sparky here — the Russian werebear assassin, the psychic supermodel — plus the much put-upon token normal agent, whose most-used piece of gear was the clicker gadget on his belt to track the collateral damage tally. I still feel proud of The Celestial Legion for being one of the more robustly documented adventures I’ve written, but I think the second and third acts need work. As is my bad habit, I came up with a great concept, detailed how it all kicks off and then the detailing and robustness of what might happen trails off as the narrative progresses. The more I think about it now, the more I realize I can’t tell you what the climax of the adventure is, or how it pays off the prior scenes. Playing with old school Arkham Horror standees and fancy tokens from Stonemaier Games, courtesy Carlo. Picking up after playing through The Gathering, Ray joined to make the group a quartet. Ray played Wendy, while Carlo, Tom and I kept Daisy, Skids and Agnes, respectively. Second time out with Agnes, I found her even more perplexing. She’s not a strong investigator, but that’s what I found myself doing. In retrospect, I should have looked more closely at her spells, as they’re more about dealing with enemies and interfering with the encounter deck. Next time we play, I’ll keep that in mind as discover whether what we uncovered during “The Midnight Masks” will be enough to help us through the final chapter of this Arkham Horror mini-campaign. If you care about spoilers for Betrayal at House on the Hill scenarios and its expansion, Widow’s Walk, gloss over the photo below and really the whole post. In this particular scenario, “The Manor of Your Demise,” the haunt consists of resetting the house and playing a sub-game in which the explorers search for the original triggering omen, the Box, with a 30 minute time limit. If they trigger a haunt within the sub-game before finding the Box, they start a new game with a 15 minute time limit. And so on, and so on. We lucked out and finished the scenario after 48 seconds, thanks to Box being on top of the omen deck. It was pure, unadulterated luck, as two separate people shuffled the omen deck, but it was a pretty cool coincidence — especially since one of the players had announced he had a hard out to go make a pizza. One thing I’m curious about is the number of timers that may be at play if multiple sub-games are initiated during the course of the scenario. The text in the Survivor’s Guide refers to starting “a timer” (emphasis mine) and never refers to stopping a timer, which say to me that the 30 minute timer keeps running even when the 15 minute game begins, and both the 30 and 15 minute timers keep running if a 7.5 minute game is initiated, and so on, and so on. If that’s the case — and one of my fellow players argued that multiple timers didn’t make a whole lot of sense, but I’m sticking with the distinction between a timer and the timer — then does the victory condition of finding the Box omen end the haunt the explorers are currently experiencing, or the entire series of nested haunts? The wording refers to “this new game,” which again suggests to me that for every new sub-game begun, it has be to resolved before the explorers get kicked out to try to resolve the prior sub-game. But I may be overthinking things.